I’ve started a new quilt. It’s pretty colorful. 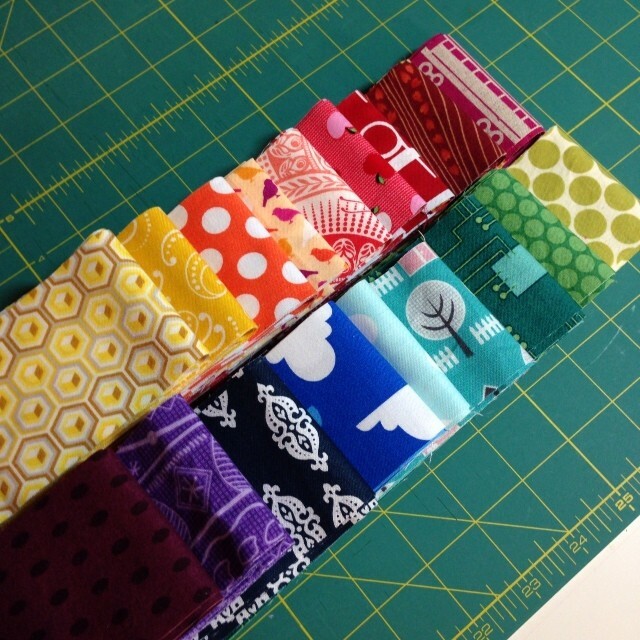 I picked 18 fabrics and cut up some 2.5″ strips out of each. For this design I really need two strips (selvedge to selvedge) in each color, but I used a lot of scraps in this project and needed to piece some smaller strips together. 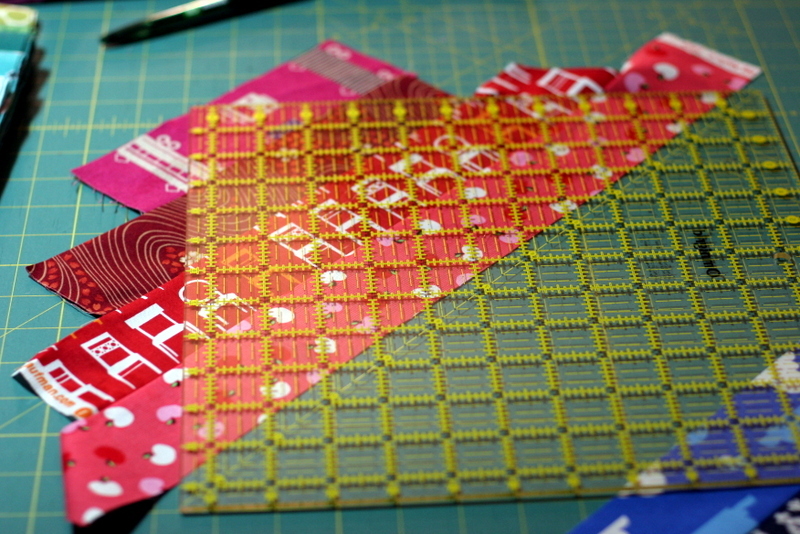 I cannot tell you how satisfying it was to use some of the scraps I’d just organized. Some of them have been languishing in bins, forgotten, for years. I’m sure there’s a correct way to measure and piece each strip, but I like to sew and cut a little more improvisationally (read: I just wanted to start sewing and stop measuring already). This was my design sketch. 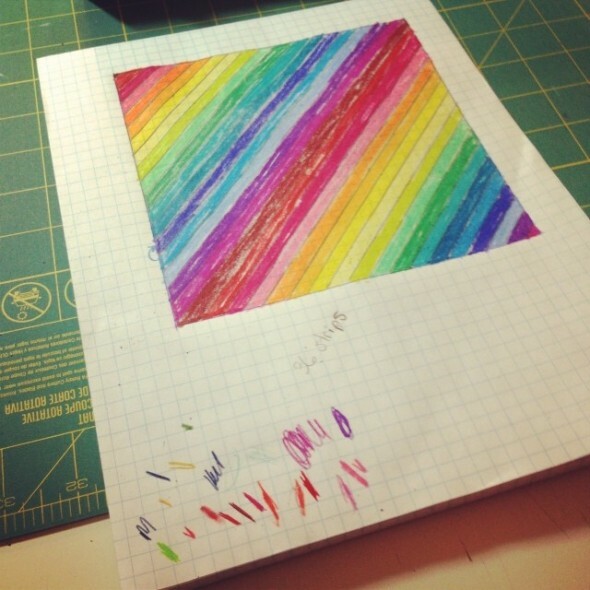 It’s going to be entirely diagonal strips, repeating the rainbow twice. I designed, cut, and measured for the quilt to be 50″ square, so I’m thinking by the time it’s all trimmed and quilted it’ll be 48″ square. It’s a good playmat size. 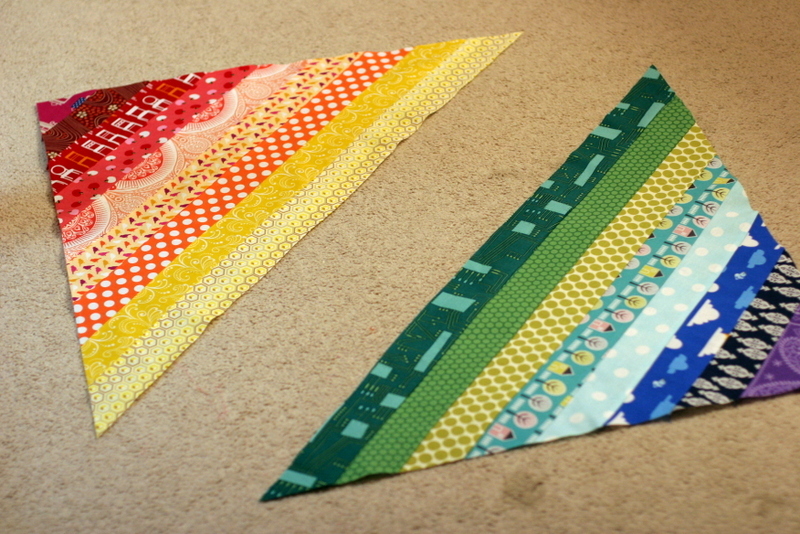 I’m working from opposite corners so that when I get all the colors together these pieces will meet in the middle. It’s a little less unruly then piecing the entire thing corner to corner, and I can lay the sections over each other to gauge how symmetrical they are. I’m almost finished with this top, and then I have to pick a backing fabric and binding. I have this crazy idea to bind it in white, but that might just be too crazy. I’ve never used white for binding before. I’m crazy over rainbow quilts ~ your fabrics will make this one sparkle! I’ve started binding with white. I really like how it makes the colors of the quilt stand out even more. Yes, white will be perfect! It’s a great idea. Test it to see how you like it.